If you cannot look to him, will you long for him, for “He satisfies the longing soul”: sigh, and sob, and groan after him. Ministers of the gospel must learn Christ as Paul learned him. They may not content themselves with that learning which they find in schools; but they must proceed further to a real learning of Christ. They that must convert others, it is meet that they should be effectually converted. John must eat the book, and then prophesy; and they who would be fit ministers of the gospel, must first themselves eat the book of God. And this book is indeed eaten, when they are not only in their minds enlightened, but in their hearts are mortified, and brought in subjection to the word of Christ, unless Christ be thus learned spiritually and really, divines shall speak of the Word of God as men speak of riddles, and as priests in former times said their matins, when they hardly knew what they said. --As cited by Timothy George in Galatians (Broadman, 1994): p. 120. In preparing to preach through Galatians in our current Sunday AM sermon series at CRBC, I have been thinking through how best to outline the book. 3. Galatians 5-6: Paul’s ethics (written in response to those who had twisted Paul’s teaching and falsely accused it of being antinomian). Clark Pinnock in Truth on Fire: The Message of Galatians (Baker, 1972) offer a similar threefold division of two chapters each calling the three sections: truth (chapters 1-2); salvation (chapters 3-4); and holiness (chapters 5-6) (p. 6). Timothy George, likewise, in his Galatians commentary in the New American Commentary series (Broadman, 1994) follows C. K. Barrett in offering a threefold division under the following heads: history (chapters 1-2); theology (chapters 3-4); and ethics (chapters 5-6) (p. 65). My point here is not to encourage you to become puffed up but to cultivate holy expectation, and hope in the Lord. Anything we receive of the Spirit is sheer grace and for God’s glory, not our own. We are the servants; Jesus is the Lord. But Hosea seems to have wanted to provoke a holy desire in Israel’s heart to drink in the dew of the Lord and to grow abundantly. Shouldn’t we also have big dreams, big desires, and big prayer requests for our spiritual growth? After all, God is able to do far more abundantly than we can ask or even imagine (Ephesians 3:20). Don’t settle for being a spiritual shrimp. Imitate Paul by praying his grand prayers for spiritual growth for yourself, your family, your church, your seminary, and the churches of all nations….. (p. 94). BTW, this is the first book I've read from Cruciform Press, a new publisher producing books that are (according to the cover blurb) "Short. Clear. Concise. Helpful. Inspiring. Gospel Focused." They produce a new book on the first day of each month, and you can subscribe at a reduced rate either to receive the new book in print or electronic form (I don't have a subscription but got mine as a gift from Puritan Seminary--give to them and you get great stuff!). 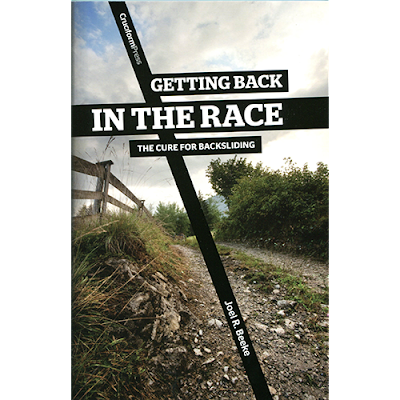 Beeke has two titles out with Cruciform (this one on backsliding and one on marriage), and there is also one on grief from Albert Martin. Some of the other titles and authors look a little YRR New Calvinist, but it is an interesting idea. This book, in particular, was brief (only 103 pp.) and simple enough to be read in short space but filled with great insights and encouragement. Great for my spiritual needs at this time. In the kind Providence of God the rain held off and we were able to observe the ordinance of baptism in the Rivanna River last Sunday morning (8/19/12). Image: A CRBC youth about to be plunged into the watery grave of baptism upon her profession that "Jesus is Lord." The questions discussed at our table were along these lines: Is the benediction a prayer? Where do we find warrant for the benediction in Scripture? Is it OK to receive the benediction with head bowed and eyes closed, continuing the posture of the closing prayer? Is the benediction a prayer? Though the benediction ends with an “Amen” and thus fittingly concludes both the closing prayer and the worship service as a whole, it is not, in fact, a prayer. Prayers are human words spoken to God. The benediction, on the other hand, is what we might describe as God’s response to our prayer and to our worship. We are not listening to the minister praying on our behalf but to God speaking directly to us. This is why the benediction comes from Scripture. It is God’s Word. We sometimes like to say that we give to God the first and last word in our worship. The first word is the opening Psalm that is read. The last word is the Scriptural benediction. In the benediction, the minister, a man who has been set apart as an officer of Christ’s church, acts as God’s ambassador and announces his blessing. The blessing does not originate with the minister. Neither I nor any other minister can convey a blessing that will have any lasting value. We are mere weak men. We are only the messengers of God’s blessing. We stand on Christ’s behalf to announce what he has declared in his Word. Is it presumptuous to think that God would bless us? No. This is one of the precious promises of God’s Word. He loves and loves to bless his people. Is it OK to receive the benediction with head bowed and eyes closed, continuing the posture of the closing prayer? The short answer to that question is, “Yes.” My experience is that many with typical “Baptist” backgrounds where worship is often concluded with a closing prayer (usually after an “invitation” or “altar call” which our church does not include as an element in worship), feel more comfortable maintaining a prayer posture. Others, for example those in our midst coming from a Presbyterian background, are more familiar with the benediction as a distinct element in worship and are familiar with opening their eyes both to see and hear the benediction. My hope is that no one would feel conspicuous or uncomfortable during the benediction. Whether you simply hear God’s words spoken to you, or hear them and see the minister as the Lord’s servant announcing them, my hope is that you will receive a blessing from the triune God of Scripture. “Brethren, the grace of our Lord Jesus Christ be with your spirit. Amen.” (Galatians 6:18). It is a most hazardous thing to tamper with the gospel of Christ. It must neither be abridged nor enlarged. It cannot admit of either without injury. An apparently very simple addition may completely “pervert” it. It seems to many no great harm to substitute, in the room of the plain scriptural statement of the gospel, a system which makes our faith and repentance, in connection with Christ’s sacrifice, the ground of pardon; but we find the apostle pronouncing a similar system a perversion of the gospel of Christ—a turning of things upside down—a making of Christ of none effect. No greater curse can befall a Christian church than to have teachers who , by their confused and erroneous statements, trouble the minds of believers, and attempt to pervert the gospel of Christ (p. 44). Note: When we took our trip up to New England week before last, we read aloud some portions of The Diary of Samuel Sewell on our drive. 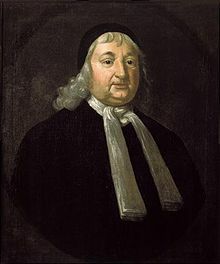 Samuel Sewell (1652-1730) was a prominent Puritan magistrate and businessman in Boston. 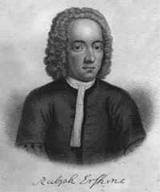 He kept his diary for nearly sixty years and it offers numerous insights on both colonial history and Puritan piety. I said, Forbear a little, and suffer me to say That amidst our bereaving sorrows We have the comfort of beholding this Saint put into the rightfull possession of that Happiness of Living desir’d and dying Lamented. She liv’d commendably Four and Fifty years with her dear husband, and my dear Father: And she could not well brook the being divided from him at her death; which is the cause of our taking leave of her in this place. She was a true and constant lover of Gods Word, Worship, and Saints: She always, with patient cheerfulness, submitted to the divine Decree of providing Bread for her self and others in the sweat of her Brows. And now her infinitely Gracious and Bountiful Master has promoted her to the Honor of higher Employments, fully and absolutely discharged from all manner of Toil, and Sweat. My honoured and beloved Friends and Neighbors! My dear Mother never thought much of doing the most frequent and homely offices of Love for me; and lavish’d away many Thousands of Words upon me, before I could return one word in Answer. And therefore I ask and hope that none will be offended that I have now ventured to speak one word in her behalf; when shee her self is become speechless. Made a motion with my hand for the filling of the Grave. Note, I could hardly speak for passion and Tears. The phrase seems to mean here ... not brother Christians, but brother ministers. All true ministers of Christ, though in the present disjointed state of the church they belong to different denominations, should consider one another as brethren and act accordingly (p. 23). Corporate prayer meetings must be a priority in our lives. Prayer meetings are often relegated to the lowest place on the list of church activities. If this attitude continues, our American churches will likely die a slow and painful death under emaciated preaching. Do you view corporate prayer as Christ viewed it—as the means of performing the greater things that He spoke of? Without using His prescribed means, how can we expect to see His promised results? Churches that have no prayer meetings implicitly declare that they do not require the work of the Holy Spirit in their church. If your church holds a weekly prayer meeting, then prioritize it in your family. Many families do not attend prayer meetings because they have young children at home. However, children learn from our priorities. They may not understand much or be able to participate in prayer meetings, but families who prioritize and participate in prayer meetings are likely to instill the same attitude and practice in their children. Children who do not attend prayer meetings become adults who do not attend prayer meetings. Directions (1445 Darden Towe Park Rd, Charlottesville, VA 22911): From Rt. 250 in Pantops, take Rt. 20 (Stony Point Rd) North; turn left into Darden Towe Park entrance and follow road, bearing right into park; turn left on gravel road at “T”; park on the left and walk to riverbank. · Coffee and doughnut fellowship at Covenant Lower School following baptism (hosted by Jenni Burks). · Morning worship at 10:30 am (Lord’s Supper). · Covered dish lunch at 12:00 noon. · No 1:00 pm afternoon service. Joel Beeke recently started a blog on which he has included a series of posts which offering reflections on his mother's recent death (on July 23, 2012). The first post on his mother's prayer life is worth reading. 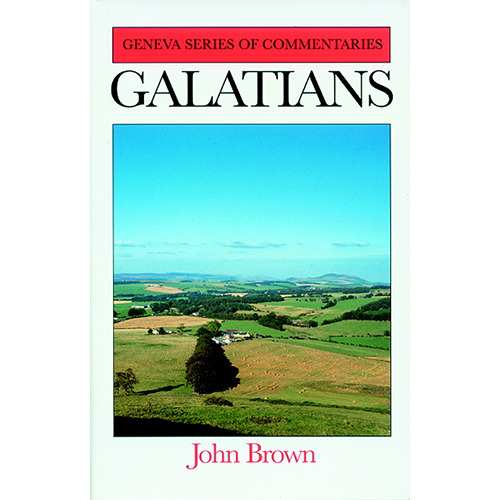 In preparing to preach through Galatians, I am reading several commentaries on this great book which Martin Luther referred to as "my Katherine Von Bora," including John Brown's classic 1853 exposition in the Geneva series reprinted by Banner of Truth. Brown's work is brimming with sharp insights. 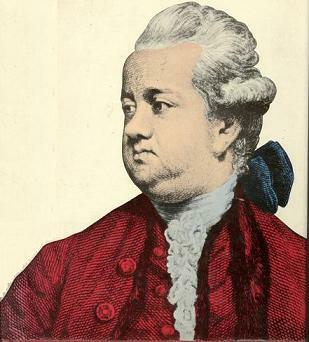 Christians, and especially Christian ministers, ought not to be ambitious of distinctions, nor very forward in claiming, in every case, the respect which properly belongs to them; but when their usefulness is endangered by men endeavoring to rob them of their authority which belongs to their office or character, it is a false modesty which would keep them back from asserting their rights. Paul was a modest man; but he would not silently allow any man to deny or extenuate the official authority with which Jesus had invested him (p. 19). I may be allowed to remark by the way, that though there is a most material difference between the Apostle Paul and ordinary Christian ministers, yet there is a sense in which it may even be said of them, if they are what they ought to be, that they are not "of men," neither "by man." There are too many who are ministers of men, who have no authority but what men gave them, and no message to deliver but what men have taught them. These men may be ministers of the Roman church, or of the Greek church, or of the English church, or of the Scottish church, but they are not ministers of Christ (pp. 20-21). Last Wednesday I had the opportunity to visit the 9/11 Memorial at Ground Zero in New York City. In the 9/11 attacks 2,977 people from over 90 nations lost their lives. The oldest victim was 85 years of age and the youngest was two. More than 400 of the victims were the first responders, the firemen and paramedics and police officers who went into the twin towers. When Paul wrote to the Galatians the first thing he reminds them of is the saving work of the Lord Jesus Christ: “who gave himself for our sins.” Galatians stands a literary memorial to the saving work of Christ. There is one who entered into this present evil world and by giving his life redeemed a people for himself. What is more, he triumphed over death when God the Father, according to his perfect will, raised him from the dead. This is the gospel. And we can never trade this gospel for another. We can never cheapen this gospel or compromise this gospel by saying that men can be saved by any other means than the death, burial, and resurrection of our Lord. Sorry for the lack of posts this week. We are enjoying a visit with our friends the Washburns in Connecticut this week. We drove into Manhattan and spent the day yesterday (Statue of Liberty, Ellis Island, Wall Street, 9/11 Memorial, Times Square, Rockefeller Center, etc.) as tourists. Deceit! Aye, but I have not told you the thousandth part of it; nor is it my business now to rake the bottom of that dunghill: what would you say, if I should anatomize some of those vile wretches called Pawn-Brokers, that lend money and goods to poor people, who are by necessity forced to such an inconvenience; and will make, by one trick or another, the interest of what they so lend, amount to thirty, forty, yea sometimes fifty pounds by the year; notwithstanding the principal is secured by a sufficient pawn; which they will keep too at last, if they can find any shift to cheat the wretched borrower. Many have been intrigued over the years by Paul’s personal note to Timothy at the close of 2 Timothy, in which the apostle urges his junior colleague to bring “the books [ta biblia]” and especially “the parchments [tas membranas].” Some have suggested that Paul was asking Timothy to bring him copies of various books of Scripture or even of his own handwritten epistles. Others have suggested that Paul was asking Timothy to bring both Scriptures and uninspired but edifying literature for him to read. 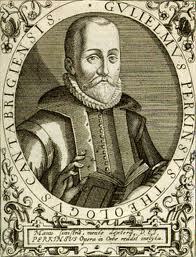 From its earliest days Christians have urged the reading of edifying books as a spiritual discipline. · Michael Brown’s A Queer Thing Happened to America (EqualTime books, 2011). This is an intriguing and insightful survey of the impact of homosexual activism in contemporary American culture. · David Murray’s How Sermons Work (Evangelical Press, 2011). This is a very practical book on preaching by our 2010 Keach Conference speaker. 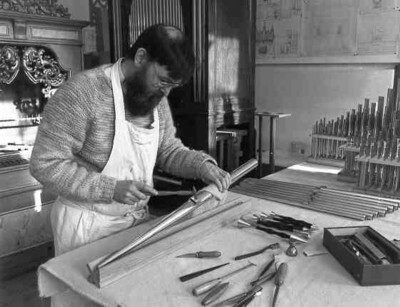 · Archibald A. Hodge and Benjamin B. Warfield, Inspiration (Baker, 1979 [original 1881]). This is a classic essay co-written by two Princeton giants defending the divine inspiration of Scripture. · Adrian Goldsworthy’s How Rome Fell (Yale University Press, 2009). This is a secular history of the later Roman Empire, but brimming with insights on the history of early Christianity. · John Bunyan’s The Life and Death of Mr. Badman (Echo Library, 2007 [original 1680]). This is one of Bunyan’s lesser known allegories on the life and death of an unregenerate man (i.e., “Mr. Badman”), but it still packs a powerful spiritual punch. I’ve been thankful for the time for restful reading and thinking and pray the Lord would open the door for you to do the same before the summer ends. Each sacred writer was by God specially formed, endowed, educated, providentially conditioned, and then supplied with knowledge naturally, supernaturally, or spiritually conveyed, so that he, and he alone, could, and freely would produce his allotted part. Thus God predetermined all the matter and form of the several books largely by the formation and training of the several authors, as an organist determines the character of his music as much when he builds his organ and when he tunes his pipes as when he plays his keys. Each writer also is put providentially at the very point of view in the general progress of revelation to which his part assigns him. He inherits all the contributions of the past. He is brought into place and set to work at definite providential junctures, the occasion affording him object and motive, giving form to the writing God appoints him to execute (p. 15). How many Christians were in the Roman Empire in the 4th century? …. All the evidence suggests that at the beginning of the fourth century Christians were a minority in the overall population. It is also regularly asserted that they were a small minority, but this is by no means clear. As usual, there are no reliable statistics, and, of course, we do not even know how big the empire’s population was. One recent study suggested that Christians represented 10 per cent of the total, but this remains purely conjectural. It is very unlikely that the numbers were smaller than this, and they may easily have been two or three times higher…. (p. 183).